On a visit to the Community Kitchen and Food Pantry of West Harlem in the summer of 2018, Antoinette B.—pet parent to a cat named Cujo—noticed pet food among the groceries, courtesy of the partnership between Food Bank For NYC and the ASPCA. But the support didn’t stop there. A sticker on the bag offered free services for pets. She called the number. “I explained I was disabled, and that Cujo needed a checkup,” says Antoinette, who set up an appointment for Cujo at one the ASPCA’s Primary Pet Care (PPC) clinics. Cujo was vaccinated and received a clean bill of health. The partnership of Food Bank For NYC and the ASPCA launched at the end of 2017. Since then, 100,000 pounds of dog and cat food have been delivered to 254 Food Bank partner pantries in all five boroughs, serving up approximately 400,000 pet food meals. 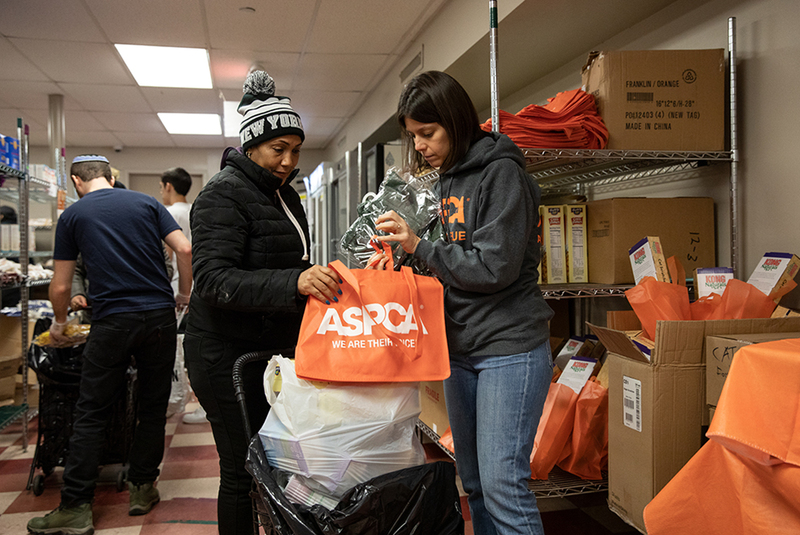 Through the partnership, Food Bank clients can access a wide range of affordable services from the ASPCA, including basic veterinary care, spay/neuter surgery, vaccinations, flea/tick prevention and other general wellness services provided by the ASPCA. An ASPCA study released in 2015 revealed that of pet owners with annual incomes lower than $50,000, 40 percent indicated that free or low cost vet care would prevent them from relinquishing their pets, and 30 percent cited free or low cost pet food as an incentive to keep their pets. 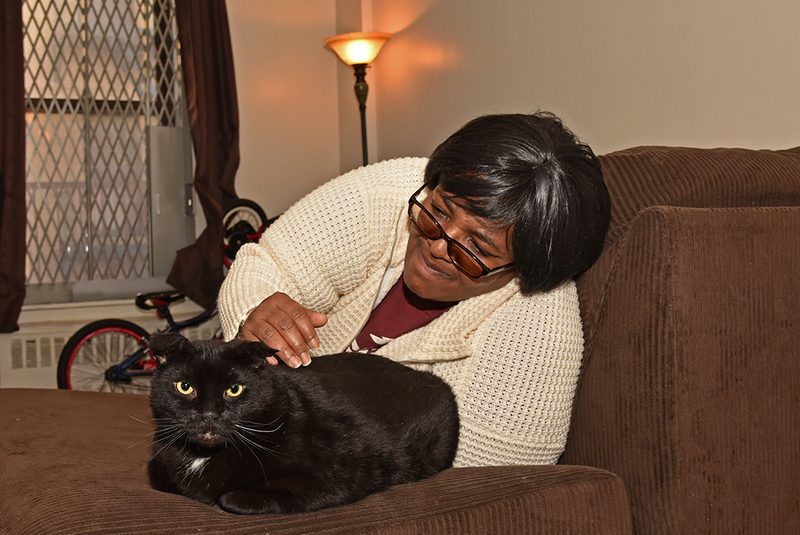 Seven years ago, while her apartment was undergoing repairs, Antoinette B. noticed a black cat in the hallway of her building. Unable to locate his owner, Antoinette and her husband, Danny, took him in. 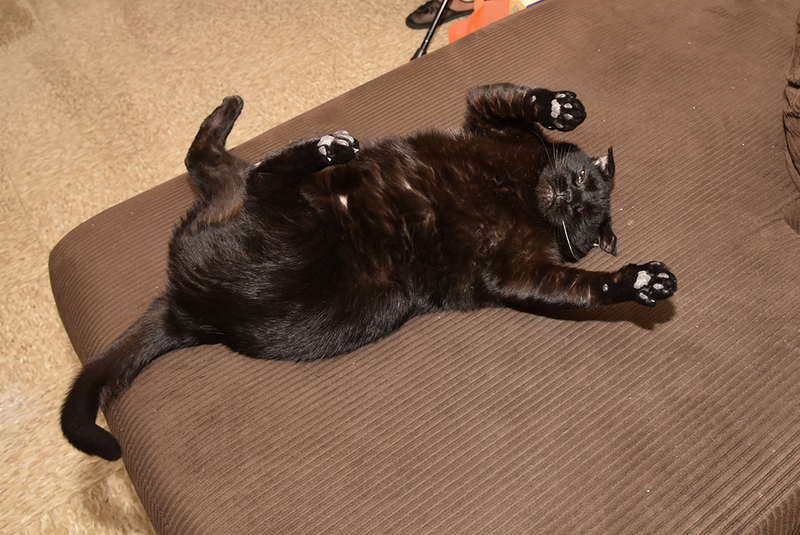 She describes Cujo as “comical,” enjoying television and fascinated by the shower. Antoinette’s four grown sons and two grandchildren also love Cujo and play with him when they visit. Though she admits the grandchildren sometimes test Cujo’s patience, he takes it in stride. Antoinette was already aware of the ASPCA’s spay/neuter program. Several years ago, Antoinette had Cujo neutered by the ASPCA after seeing a flyer in her neighborhood advertising our spay/neuter services. She also referred her sister’s two pit bulls for neutering services. In October 2018, weeks after his original checkup, Cujo suffered an aural hematoma, a painful ear condition resulting in blood vessel ruptures. Blood and fluid filled the area between the skin and cartilage in one of his ears. “He was crying, and his ear was inflamed,” recalls Antoinette. “My baby was suffering, and I couldn’t stand it.” She called the ASPCA, hoping we could help. Cujo was treated at an ASPCA partner clinic. In December, his other ear ruptured, and Cujo was treated at the ASPCA Animal Hospital, where he remained overnight for observation. 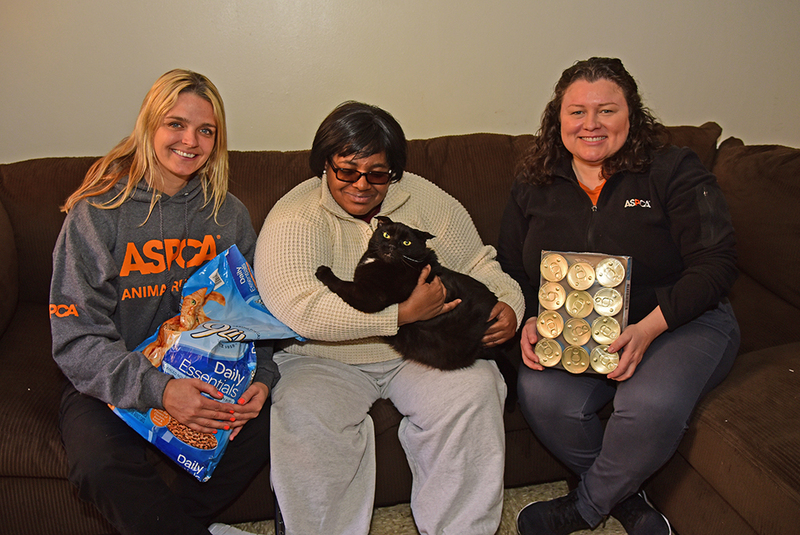 In January, the ASPCA’s Erin Earley, Director of Community Engagement, and Delores DeFerrari, Director of Operations, Community Medicine, paid a special visit to Antoinette and Cujo, offering a refill on pet food and cat toys. Antoinette is also happy with the quality of the cat food she’s received at the pantry, saying it’s nutritious and has helped the once 27 lb. Cujo lose weight. 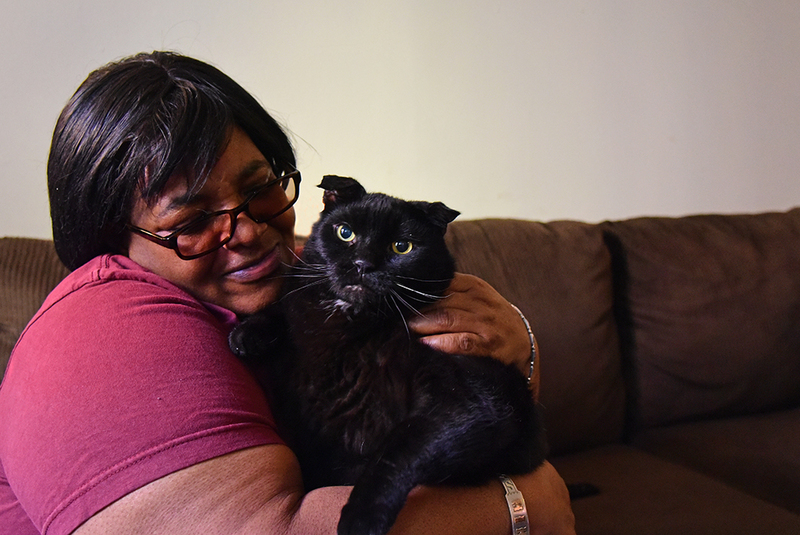 “The ASPCA really came to my rescue for Cujo,” says Antoinette, whose sentiment captures the goal of the ASPCA and Food Bank For NYC’s partnership: to help people and pets equally, especially when they share the same challenges.